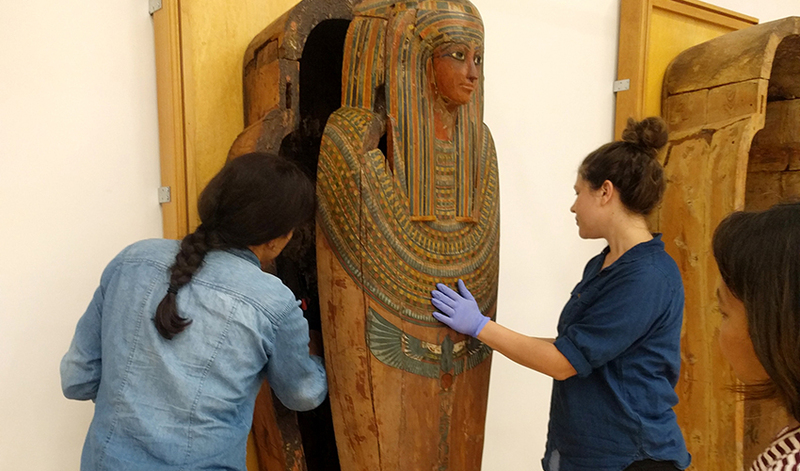 From left: Independent mount maker Camille Duplantier, graduate student Kelin Verrette and Global Museum Associate Director Christine Fogarty handle a sarcophagus. Admission-free museum to showcase University collections of artifacts from Africa, Americas, Asia, Egypt, Oceania, spanning ancient world to 20th century. Opens April 26. The procession of stretchers wrapped in protective white paper moved carefully across campus. “Are they statues?” one passerby asked. Grandfather clocks? Could they be human remains? The answer may surprise you. Mummies and sarcophagi that belong to SF State were making their way to the University’s new Global Museum in the Fine Arts Building. The moving day represented a significant milestone in preparation for the Global Museum’s grand opening, scheduled for April 26. Faculty, staff and students in the Museum Studies Program spent a year preparing to move the collections, in consultation with independent conservators and preparators who also worked with the Fine Arts Museums of San Francisco. They checked the condition of all materials. They choreographed every literal step, analyzing possible roadblocks such as weather, foot traffic, narrow doors and corridors and elevator access. The occasion also provided a valuable lesson for students, says Professor Edward Luby, director of the Museum Studies Program.